Krynica-Zdrój was founded in 1547 by Danek from Miastko (currently Tylicz) and was originally known as Krzenycze. It was part of the so-called Kres Muszyński, belonging to the cracovian bishops, until the First Partition of Poland. In 1793, an Austrian official, Franciszek Stix von Saunbergen, bought the land, together with the mineral springs located there, in hope of setting up a mineral spa. First mineral spas came into being then, but they really developed after 1856, thanks to Professor Józef Dietl's activity.In 1877 there were 11 health-resorts and 64 private houses that admitted patients. Around the same time, a Spa-resort Committee was born. At the turn of the century, Krynica-Zdrój was being visited by at least 6000 patients a year. The beginning of the 20th century marks further development of the mineral spa franchise. New villas and guest-houses appeared, and the most effective therapeutic water was discovered, studied and named by Professor Rudolf Zuber - the Zuber mineral water is the best treatment mineral water in Europe. 1911 was the year that got Krynica two very important things: town priviledges and a railroad, which resulted in even more visitors coming. A year before the WWII outbreak, Krynica was being visited by 38000 people a year. In January, 1937, the future Queen of Holland, Princes Juliana visited Krynica with her husband, Prince Bernard and they spent their honeymoon here. From 1944 till 1945, Krynica was the place of residence of the apostolic Ordinary of Lemko land, Ołeksander Małynowśki. Krynica was under occupation until January 18th, 1945. The withdrawing Germans took all the appliances they could, and the Soviet Red Army destroyed all that was left. Krynica didn't fully recover from the war until late 50s. One funicular railway onto the famous Góra Parkowa survived the war, and was quclky joined by another - a cable car onto Jaworzyna (1114 meters above sea level). It can transport 1200 persons per hour. That investment turned Krynica into a big skiing resort. The oldest building in Krynica is the 'Słotwinka' pump room, back from 1806. 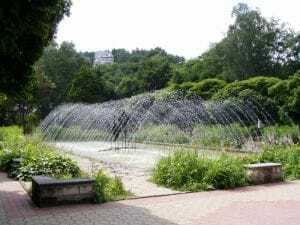 It had originally been located where the main pump room is now, but was relocated in the middle of the 19th century and is currently situated in the Słotwiński Park. It's open only seasonally, during summer. Other historic buildings of the spa-resort include the Łazienki Borowinowe from 1881 and Stare Łazienki Mineralne from 1863-66. In the middle of the promenade, there is a neo-Renaissance building, the Stary Dom Zdrojowy (Old Spa House) from 1889, in which a pump room called 'Mieczysław' was located. In 2007 it was renovated and re-opened for visitors. A lot of villas were built behind the building, one of them - the 'Romanówka' is where the Nikifor Museum is located. Nikifor, or rather Epifaniusz Drowniak (1895-1968), was a local naïve painter of Lemko origins, famous worldwide and often called 'the Matejko of Krynica'. Next to the main pump room is the famous concert venue, the 'Muszla'. It has a built-in commemorative table honouring Jan Kiepura (1902-1966) who, using money that he earned on various stages across the world, built the Patria Villa, designed by Bohdan Pniewski and worth 3 million dollars. Several movies were shot there in late 30s. Next to 'Muszla', there is the Nowy Dom Zdrojowy (New Spa House) from 1939. Not far away, there's also a monument of Mickiewicz from 1906. Krynica-Zdrój is a health resort for all seasons. Situated in the Popradzki Park Krajobrazowy (Poprad Landscape Park), it is a great base camp for going to the mountains. The town is one of the biggest winter sports centres. You can ski on the slopes in Krynica-Słotwiny and the Jaworzyna (1114 meters above sea level) The Dwie Doliny Muszyna-Wierchomla resort, with the longest chairlift in Poland is close by, and since 2008 the main attraction is the fact that Muszyna and Wierchomla are connected by 10 cable cars. The inhabitants of Krynica-Zdrój's favourite sport is ice hockey. They are faithful supporters of the local ice hockey team, KTH, established in 1928. They even held the EIHC (Euro Ice Hockey Challenge). In 1931, the World Championships in ice hockey were organised here. Krynica-Zdrój is the birthplace of Polish tobogganing. The first tobogganing team emerged in 1909, under the supervision of the Makabi Sports Club. The first tobogganing route, which no longer exists, was built on Góra Parkowa in 1929 and witnessed great sport events, like the first Polish Championships (1930), European Championships (1935) and World Championships (1958 and 1962). The most recent event was the European Championships of Juniors (1979). In 2008, modernisation of the route was initiated, in order to create an artificially iced route for tobogganing, bobsleighing and skeletoning and fulfilling all the requrements for organising international events. The works are planned to be ended by November 2010. - servicing and equipment renting. - the toboggan is for 2 persons, children under the age of 8 may ride only with adults. You will love every second of the ride, thanks to the wonderful atmosphere, the picturesque landscapes, the professional staff and the additional attractions. It is truly an unforgettable experience. The Ice Hall offers ice-skating to everyone. The ice rink is open through most of the year, except for a renovation break (May-June). You may also watch local competitions in ice hockey.